Industrial and inexpensive, and can easily replace cheap rum in mixed drinks. I beg you, forgive me. I am but a simple man who found himself at the doors of a great university filled with booze. We were out of rum, and what’s a liquor cabinet without rum? It’s nothing—nothing worth writing about, for sure. But I am a poor, simple man, so I went to my local booze merchant to find the cheapest rum I could buy. This is a quest fraught with peril, because cheap rum is, generally, horrible. White or silver rums, below $20 for 750ml, taste like nail polish remover, even the big-name brands. A bottle of Velho Barreiro Cachaça, confusingly labeled. So I studiously avoided them, and looked for something that might be inexpensive, but not awful. I saw a bottle from Velho Barreiro which said it was aged and double filtered. Brazilian rum, I thought, sounds interesting. I completely ignored the bolded, black type that spelled out, cachaça. What settled it was the price: $12.99. I took it home, and it sat on my shelf; all along, I thought it was rum. I served it to my wife and Melba, in a cocktail, telling them that it was rum. Putting a shot-full of it into a snifter, I tasted it, and I was incredibly impressed. It was sweet, no overwhelming vapor, no acetate. How did I get this incredible rum from Brazil for less than $15? The difference between cachaça and rum, I would later find out, is that, while both are sugar-based distillations, rum is distilled from molasses, while cachaça is distilled directly from the sugarcane. What a difference. The esters that last through the distillation process in rum can be harsh, even though most are aged a year before bottling. (All this talk about harsh rums stops at oak-aged gold rums—I love me some premium gold rums.) But the cachaça was smooth, no harsh flavors. In my subsequent research, I discovered that Velho Barreiro produces industrial cachaça, as opposed to artisanal, which explains the price. Should anyone find and pick me up a bottle of artisanal cachaça, I’m eager to see what barrel-aging does to the liquor. Only 1% of the cachaça produced in Brazil is exported, to anywhere in the world, so I may never see any of the artisanal. My funds to visit the motherland (of cachaça) are limited. When I picked up the cachaça, it was next to all the rums, and, in fact, the United States classifies it as a rum, so I don’t feel that stupid for not realizing it was different. And it was a serendipitous discovery, in any case. I’m looking forward to trying it in Brazil’s signature cocktail, Caipirinha—ice, sugar, lime, and cachaça—all great ingredients. The discovery that the bottle of Velho Barreiro was not actually rum came when Mrs. Ferment looked in our cabinet to find this rum I had been going on about. She could not; although, the bottle is long and has a yellow label. From an adjoining room, I incredulously said that it was right in front of her, but she was insistent that there was no rum. Of course, she was technically correct—the best kind of correct. Update: The craft-process for distilling cachaça is “artisanal,” not “artesian.” I’ve corrected it in the article. ← Is the worm platinum too? My profession has called me to visit rio about 3 time per months. The hotel provides a free cocktail at the bar. The bar gal made a caprihinia using Caninha Da Roco (3.9 Rheas at the local grocery 600ML.) The Grocery also has Velho Barreiro HOFEA for about 5 Rheas. My Brother, retired ag teacher is always pushing cane syrup on me after he and some of locals cook off sugar cane to make the stuff. I think after a few caprihinias I can convince him to seal off the syrup kettle, run it to a distillation tube, and produce a much more popular product. 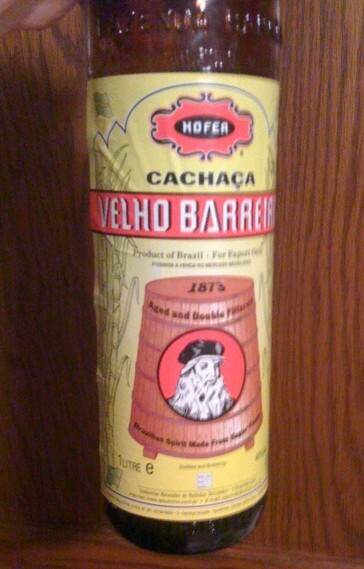 I bought my first bottle of Velho Barreiro a couple months ago….Scenario: at a party mixing caipirinhas, and went through the last of two-and-a-half 5th’s of Ypioca 10 minutes before the main alcoholic beverage store closed — outlook bleak. The most exotic spirit found in a trip to the supermarket was whipped cream-flavored vodka — outlook at mission critical. A friend whose reward will come in heaven called and mentioned another spirits store, called them, and found out they were still open. They had cachaca — one brand and one bottle left :) After driving at the speed of light, I arrived to find the price for a liter — not just a 5th — was $25! Outstanding value! So we were able to keep the party going….a horrific outlook turned on its head. Please check out my blog on drinking culture and its connections, The Congenial Hour, at http://thecongenialhour.tumblr.com/ Thanks in advance. I don’t know where you are located, but in the Ironbound district of Newark, NJ, there are liquor stores serving the Brazilian community that carry a few of the artisanal cachaças. Among these are Boazinha (listed above), Seleta, Meia Lua, and Beleza de Minas. All of these are carried by Rios Liquors, a Boston distributor with great products and poor marketing. The gold cachaças are my favorites, and are aged in woods such as balsam and umburana (a tropical which some sites say is in the cherry family). Maria da Cruz and Lua Nova are also quite good artisanal cachaças. If you see them on the shelf and don’t know any brands, either is a good bet. Great question, Ellen. Unopened bottles have an indefinite shelf life. A 30-year old unopened bottle should be as good as one that was just purchased. But once the bottle is opened, it’s contents begin to oxidize. Basically, if it smells or tastes off, then it’s past its shelf life, but there is not a hard and fast rule. I’ve kept open bottles of brandies for a few years without detriment. Alcohol doesn’t usually spoil. It will just taste differently.